Colorblock lace panel dress with asymmetric hanky hem with striped knit bodice with show bow trim. Machine wash. Imported (Philippines). Dress of polyester/rayon; Top skirt of cotton/nylon; Lining of polyester; Exclusive of trim/decoration. Matching/Coordinating sister styles available in sizes 4-16, search for style(s): BNJ-1999. More baby & girl party dresses available, search for: "iPovePou-girl-dresses "
Matching/Coordinating sister styles available in sizes 4-16, search for style(s): BNJ-1999. 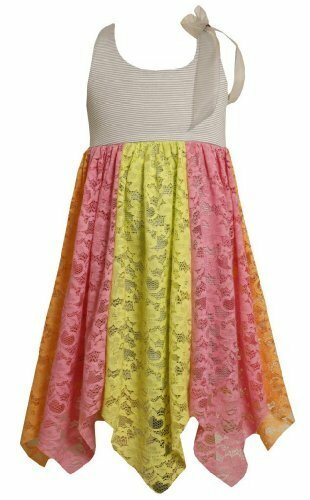 More baby & girl party dresses available, search for: "iPovePou-girl-dresses "